We all know what a white paper looks like but where did it come from? As someone who loves writing, I’m always curious to discover where words come from. One that always bugged me was white papers. Why white? I did some digging around to discover where they came from. Here’s the scoop. 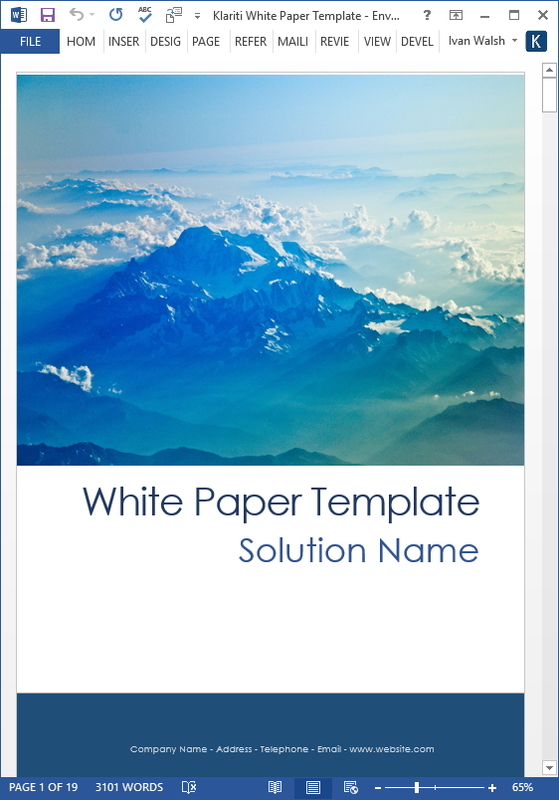 White Paper Templates – Improve the quality of your white papers with 15 royalty-free MS Word White Paper templates. In this article, we’ll look at the history of the white paper, why it was so called, and how it has evolved over the years. Government – This type of white paper is a format report that outlines a policy, proposal or an issue that affects the general public. In some countries, it is referred to as a ‘parliamentary paper’. Technology – This second type of white paper is authored for software companies, for example, when developing a new technology, positioning a product in the marketplace, or when they wish to develop thought leadership. How Did White Papers Become White? One suggestion is that White Papers may have developed from so-called “Blue Papers” in 19th century Britain; the report’s cover was blue. These legislative documents were delivered by Government for discussion in Parliament. However, if the material for a Blue Paper was too light or informal, it would be published with white covers instead. In time, these were simply referred to as White Papers. The term has a slightly different meaning in the US, where government white papers refer to Background Report. In addition to white and blue papers, you can also find green papers. These are most common in Great Britain, Ireland and the United States. This is a specific type of government report that outlines a ‘potential’ line of action. For example, before the law is changed, the Government might issue a green paper describing how the law will be changed, who will be affected, and what one needs to know when it’s introduced. When the European Commission publishes a green paper it is intended as a ‘discussion document’ to stimulate debate on a particular topic. The purpose of a green paper is to encourage interested parties to contribute to the dialogue and share their knowledge, insights or reservations. Following this round of consultation, it may evolve into a formal white paper where an official set of proposals are clarified. In Canada, a green paper is an official document sponsored by the Crown. These are discussion documents issued by the government for public debate, not official policy documents. McDonald White Paper of 1939 – This called for the creation of a unified Palestinian State. It suggested that there would be limited Jewish immigration and limited ability to buy land. In Place of Strife – This White Paper was intended to abolish the Indian Act in Canada and recognize First Nations as the same as other minorities in Canada. Until 1969 they were a distinct group. It seems that white papers are a by-product of blue papers, which ironically don’t exist anymore. They have first cousins in the Green Paper; I’ve heard Grey papers mentioned but couldn’t find much information.